Preliminary concept rendering by Michael Van Valkenburgh Associates of the proposed Harold Simmons Park and city-side access outlooks. Rendering by MVVB. Kevin Sloan Studio’s re-wilding concept for the park is inspired by the original Blackland Prairie. Rendering by Vincent Hunter, AIA. Courtesy Kevin Sloan Studio. The notion of a highway along the Trinity has roots well back into the middle of the 20th century, as does the idea of a great Trinity Park adjacent to downtown. Its most recent revival occurred with a 1998 bond election, when Dallas voters narrowly approved $246 million for the Trinity project, in a multifaceted ballot item that funded five key components: transportation (including a vaguely defined Trinity Parkway); flood protection; economic development; recreation; and environmental restoration. 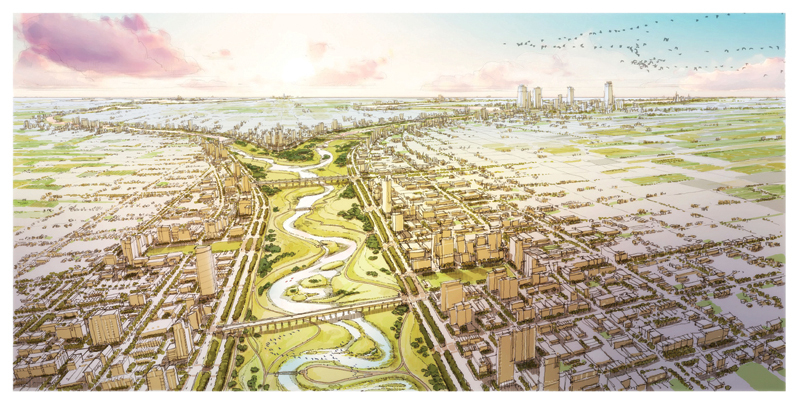 AIA Dallas, along with most other professional and business groups, supported the measure, as they believed this would lead to the creation of the desired Trinity Park. In 2002, however, many community leaders and activists, including those of AIA Dallas, grew concerned over designs for the Trinity Parkway as they were released by the city, the North Texas Tollway Authority (NTTA), and their engineers. It became clear that the multifaceted Trinity project was morphing into a high-speed highway project, with other components — including the Trinity Park — clearly secondary to the “needs” of the road. Responding to a vocal and broad outcry, then-Mayor Laura Miller led an effort to create an integrated approach to the project that would balance the various components, so that no single element (like a toll road) would overwhelm the others (like a park). The result was the 2003 Balanced Vision Plan (BVP), developed by Alex Krieger, FAIA (then of Chan Krieger Sieniewicz of Boston), and highly praised by community and professional organizations, including AIA — the BVP received an AIA national award for Regional & Urban Design. The Dallas City Council formally adopted the BVP, and the project moved ahead, supposedly based on the principles outlined within. Delays inevitably occurred (including the impact of increased flood standards prompted by Hurricane Katrina) but, finally, in 2014, NTTA revealed specific designs for the toll road (by then known as Alternative 3C). To be blunt, all hell broke loose, as the proposed design did not resemble the Balanced Vision Plan in almost any regard, and it was clear to many, including AIA Dallas, that the highway advocates were back in charge of the project. A semi-organized resistance immediately sprang up that spanned all parts of the community. Numerous individuals and organizations spoke out against 3C, including former Mayor Laura Miller, AIA Dallas, the Dallas Morning News, D Magazine, the Dallas Observer, the Greater Dallas Planning Council, former and current city council members, and even Krieger himself. To be sure, there were still many die-hard 3C supporters, including other former mayors and council members, current Mayor Mike Rawlings, and the Trinity Commons Foundation (a civic booster group for the Trinity). council briefings, and at professional and civic symposia. A relentless effort by 3C opponents, including AIA Dallas, countered and refuted argument after argument put forth in support of the toll road. These efforts were greatly assisted by: studies released by transportation authorities that indicated that the mobility benefits of the toll road were minimal and dubious; by soaring construction cost estimates; and by a complete lack of credible sources to pay for it. The final spike was driven through the heart of the (zombie?) toll road by the outcome of the city council elections of May 2017, when enough anti-3C candidates were elected or re-elected to create a council majority (for the first time). The writing was on the wall, and in their first meeting after their July break, the new city council voted to formally kill Alternative 3C. The final vote was 13-2, reflecting the community-wide sea change of opinion that developed over the past three years. A great sigh of relief washed through the anti-roaders as almost 20 years of opposition to the Trinity toll road finally came to an end. The death of 3C — while a turning point — is not the end of the controversy in the Trinity saga. At the same meeting, the city council authorized creation of a Local Government Corporation (LGC) to oversee the design and construction of the Trinity Park, moving primary responsibility for the park outside of City Hall for the first time. This structure is modeled in part on other cities’ approaches to park creation, including Houston and New York. It is expected that the new LGC will work closely with the Trinity Park Conservancy (TPC) to raise needed funds, hire consultants, and develop designs for the Trinity Park. That effort is already underway, to some degree, and preliminary concepts have been previously released by the TRC, developed by the noted landscape firm Michael Van Valkenburgh Associates (MVVA). These new concepts are based on a more natural approach to the river, eschewing formal park designs and amenities (like ball fields). Nevertheless, extensive design intervention in the Trinity floodway is anticipated, with early cost estimates at $150-250 million. TPC has already secured $50 million of this as a donation from the estate of the late billionaire Harold Simmons, subject to certain conditions, including naming the park for Mr. Simmons. The city still has approximately $47 million remaining from the 1998 bond election as well. Another view has surfaced that counters the MVVA approach. This latter view was proposed by former council member Angela Hunt, Wick Allison, publisher of D Magazine, and others, including some current council members. Based largely on the “re-wilding” concepts of landscape architect Kevin Sloan (see Texas Architect March/April 2017), this view proposes a more modest design approach that would work within a budget aligned with the city’s remaining $47 million, with claimed benefits of earlier delivery and lower operation and maintenance costs. Subtexts to this controversy will be many, including accusations of economic and racial elitism, perceived lack of public input, an upcoming 2019 mayoral race, and gentrification challenges already affecting neighborhoods south and west of the river. the heart of a thriving urban setting. Robert L. Meckfessel, FAIA, is president of DSGN Design and currently serves on the boards of the Trinity Park Conservancy and the Trinity Commons Foundation, and on the AIA Dallas Public Policy Committee.